The school Summer holidays maybe over (or nearly over depending on where you live) but that doesn’t mean that you should stop thinking about holidays! 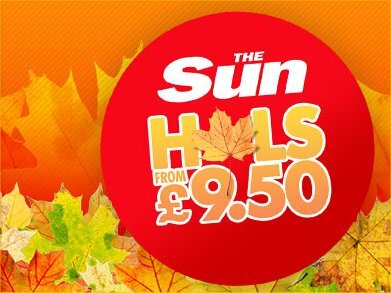 If the long break has left you a bit short of cash – fear not as this Saturday (30th August 2014) sees the return of The Sun £9.50 holidays. If you have booked before simply collect 7 tokens (either from the Newspaper or online – I will add them here as I know them), and enter your priority reference number. This should have been sent to you if you have previously booked in the last 2 years. If you haven’t received one then do get in touch with them at: thesun@email.thesun.co.uk. If you have not previously booked there is a separate link to apply the following day, or you can collect the codes from the newspaper and send them off. Previous bookers can see immediately where and when they have been allocated and change their choice if they desire. The site is opening on Thursday September 4th 2014 and the Closing date is Friday 26th September 2014. Please be aware that the opening could be as early as 12:01AM and people stay up to ensure that they get their desired holiday. There is a £1.90 online booking fee (visa/debit transaction). Prices are booked on a minimum of 4 people sharing. Even babies have to be included as a person. With 197 top parks to choose from in the UK, Ireland, France, Spain, Italy & Holland. Note October half term (Monday 27th– Friday 31st October 2014) is NOT included. You could, however, take advantage of leaving after school on Friday 24th October 2014. Now included are some December breaks. Personally, for our family of 6, even a trip away with our tent is more expensive (in the UK). We have always been happy with the price we have paid, compared with how much we would have to pay if we tried any other way of having even a comparable holiday. Do take a look at how much it cost us (3 adults and 3 children) to go abroad in July, staying in a theme park). The Sun Holiday Codes come out several times throughout the year, meaning that you can book more than one. 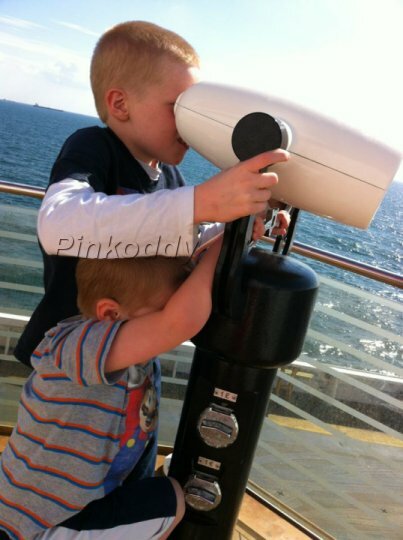 We have actually booked a Monday-Friday, followed straight by a Friday-Monday break in the Isle of Wight this year. It is always worth checking how much it would cost to book directly with the site. It may also depend on the size of your party. As a family of 6 Butlins was never available, but we were able to get a Sun holiday to Butlins when there were only 5 of us (also for a guaranteed no more than £15 pp). Do consider that how much you pay is dependent on where you go and when. Do you want a particular holiday or do you have a certain budget? What kind of holiday are you after? If you are used to going all-inclusive then these may not end up being the cheapest way to take a holiday – but if you want a bargain break and are willing to do all your own cooking then I really do recommend them. I have to admit that when we went to Torbay, Devon April 2013 it was bitterly cold, that would have been the same if we had of paid more money but not if we had of opted to go somewhere with a hotel (for example) – so it really does boil down to what you want, and what you are prepared to pay. 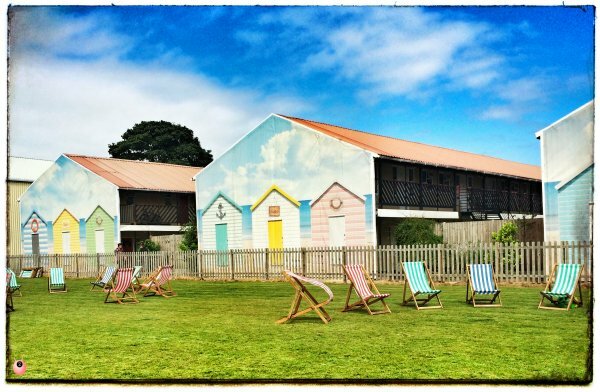 When we went to Newquay View Resort it was also quite noisy at night – but so much cheaper than anywhere else for its location, which (for us) was worth putting up with. Holidays are self-catering and there is additional charges for entertainment, gas/electric and linen. Reduce this cost by booking one of the guaranteed only £9.50 Sun Holidays and take your own linen. Making the holiday this cheap also means it is worthwhile coming back early on a weekend break to avoid school fines. You may want to think about where you want to go before the site opens as people move pretty fast. Do you want somewhere local (especially if you are thinking of coming back early), to visit somewhere in particular, or cheap? Try to make a list of all these places so that if your first choices are gone when the site is open you can quickly change them for somewhere else. Think about how you are going to get there? If you are using public transport is there a train station or coach depot near to the camp site? Sun holidays to Europe do not include flights – a long drive may cost more in fuel/ferry crossings than a flight included in a package deal (see my post on whether long ferry journeys are worth it). Each of the parks tell you how much extra they charge, so you can work out how much each park would cost you depending on the size of your party. Look out for the Ferry deals too – again be aware that they may not be right for your vehicle (we have a people carrier with top box making it higher than normal) and the sun code did not apply. Take a look at my what to pack for a £9.50 Sun holiday and check out my previous Sun Holiday Reviews for specific parks we have been to. This is NOT a Sponsored post. I am in no way affiliated with The Sun or the holiday providers. This is really useful Joy – I have considered doing this for a while and now our family is a bit smaller with 2 eldest leaving home I think we may be able to do it- do they take bookings for families of 7? I cannot see why not, but my honest answer is I don’t know. I assume so because my uncles each had 5 children each and they used to come on them with us as a child. It may restrict which parks you go to though. Please can you tell me how some people can book at midnight & where they get the 7th code from if it’s not printed in the newspaper until the next morning.